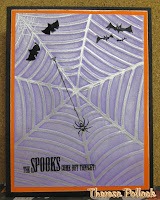 My Halloween Cards: Used Fiskars Texture Plate for spider web. Inked with Brillance Moonlight White ink after embossing by lightly wiping with inkpad. 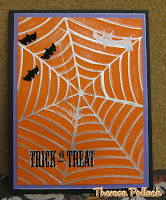 Hightlighted webs with silver pen. 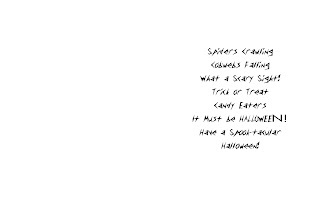 Paper with ghosts came from Joanne's . 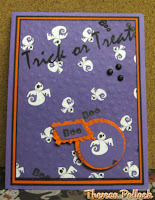 Embossed with Fiskars Bubbles Texture Plate. 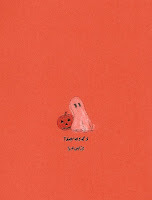 Cut out Ghost and word Boo from paper with round punch and scissors. Matted on orange scraps. Added stickers that I found at garage sale. Double mat on all cards in combos of black, orange, or purple CS. Edged CS Mats with Black markers.